Every year, millions of people with back injuries, neck injuries, and pain undergo painful and expensive spine surgeries, or subject themselves to the risk of high dose epidural steroid injections. Frequently, surgery does not help their original pain, and they are left with other painful conditions such as decreased back motion, diminished activity levels, and chronic muscle spasms. Those who choose epidural injections typically experience minimal short term relief, but expose themselves to serious longer term side effects. Bone marrow-derived autologous stem cell therapy offers an exciting option for relief from debilitating back pain. Avoid surgery and pain medications with this minimally-invasive treatment. Read this article by one of our Board Certified Orthopedic Spine Surgeons demonstrating how mesenchymal stem cell disc injections can be an effective treatment for degenerative disc disease. The annulus is the area of the intervertebral disc that connects each vertebra together. With age, the disc begins to degenerate and can sometimes tear with repetitive motions. An annular tear may also occur after a traumatic injury, common in athletes that play high-impact sports or people with very physical occupations. Radial tears — Typically caused by the natural aging process, radial tears begin at the center of the disc and extend all the way through the outer layer of the annulus fibrosus. These tears can cause a disc to herniate, which occurs when the center nucleus of a disc extrudes through the tear to the outside of the disc. Peripheral tears — These tears occur in the outer fibers of the annulus fibrosus and are usually brought on by traumatic injury or contact with a bone spur. Peripheral tears can lead to the degeneration or breakdown of an intervertebral disc. Concentric tears — When a tear occurs between the layers of the annulus fibrosus circumferentially, it is called a concentric tear, which is usually caused by injury. Arthritis of the spine typically affects adults over the age of 50, but can also occur at a much younger age from injury or overuse. While any part of the back can be affected, the lower back is the most common site of arthritis pain, most likely because it bears more of the body’s weight. Arthritis of the spine develops in the facet joints, located between each vertebra. As we age, the cartilage lining the joint surface can shrink and wear thin, causing bone spurs and enlargement of the joint. This often leads to the inflammation and pain of arthritis. In addition, it can lead to loss of flexibility, irritated nerves, and sciatica. Osteoarthritis — The most common form of arthritis of the back, osteoarthritis is a chronic condition characterized by the breakdown of the cartilage that cushions the ends of the bones where they meet to form joints. In the spine, this breakdown occurs in the cartilage of the facet joints, where the vertebrae join. As a result, movement of the bones can cause irritation, further damage and the formation of bony outgrowths called spurs. These spurs can press on nerves, causing pain. New bone formation can also lead to narrowing of the spinal canal, known as spinal stenosis. Rheumatoid Arthritis — Rheumatoid arthritis is a chronic inflammatory disease of the joints that occurs when the body’s immune system mistakenly attacks the thin membrane that lines the joints. Although rheumatoid arthritis most commonly affects the hips, knees, hands, wrists, feet, elbows, and ankles, it can also affect the facet joints in the spine. This causes pain and, in severe cases, destruction of the joints. This may also allow the upper vertebra to slide forward on top of the lower vertebra, a condition called spondylolisthesis. Ankylosing Spondylitis — Ankylosing spondylitis is a chronic inflammatory disease that primarily affects the spine, particularly the sacroiliac joints near the pelvis, and the hip joints. Ankylosing is a term meaning stiff or rigid and spondylitis means inflammation of the spine. Psoriatic Arthritis — Psoriatic arthritis is accompanied by the skin disease psoriasis. For about 20 percent of people with psoriatic arthritis, the disease involves the spine. In some cases, bony overgrowth can cause two or more vertebrae to fuse together, causing stiffness. Infectious Arthritis — Also called septic arthritis, infectious arthritis is caused by an infection within a joint. It can occur in the facet joints of the spine. Infectious arthritis is often caused by bacteria that spread through the bloodstream to the joint. Sometimes it is caused by viruses or fungi. Arthritic pain is often worse in the morning, but may also occur when the weather changes, after over-exertion, or even after long periods of sitting. Adult stem cell therapy may be an alternative treatment for chronic arthritis. This same-day procedure may provide pain relief and improve cartilage quality in the spine. If you’ve been having severe back pain caused by arthritis, regenerative medicine may be the path to get you back on your feet. Bone spurs, or osteophytes, are bony projections that develop along the edges of bones, often forming in joints. They are usually smooth, but can cause wear or pain if pressed or rubbed on other bones or soft tissues such as ligaments, tendons, or nerves in the body. Bone spurs can form on any bone in your body, including the vertebrae of the spine. When they develop on the spine, they begin to compress a nerve root or the spinal cord itself. This compression is what typically causes the pain and discomfort associated with bone spurs. Spinal Osteoarthritis — Joint damage from osteoarthritis is probably the most common cause of bone spurs. As osteoarthritis breaks down the cartilage on the ends of your bones, the body will attempt to repair the loss by forming bone spurs near the damaged area. Disc Generation — In time, tendons (which hold muscles to bones) and ligaments (which hold bones to bones) in the body will start to tighten and pull the bones away from where they should be. This pulling creates friction and can eventually stimulate the production of bone spurs. Disc Degeneration — Soft, gelatinous discs separate the vertebrae of the spine. As these discs wear down, the vertebrae come into contact with each other, which can trigger the development of bone spurs. Traumatic Injury — Though this is a little less common, high-impact sports, auto accidents, and other sudden impacts have the ability to accelerate spinal deterioration – ultimately leading to the development of bone spurs. While most people associate bone spurs with localized pain, they can actually cause a variety of symptoms depending on the cause, severity, and location of the bone spurs. Symptoms are often at their worst early in the morning or after prolonged periods of inactivity where the back stiffens up. Yet as time passes on, many people begin to experience chronic pain as a result of their condition. Adult stem cell therapy may provide pain relief for some patients with bone spurs. A bulging disc is usually considered a normal part of aging and is not necessarily a sign that anything serious is happening to the spine. Intervertebral discs most likely begin to bulge as a part of both the aging process and the degeneration process. Approximately 90% of bulging discs occur in the lower back, or lumbar area of the spine. A bulging disc is a fairly common occurrence in both young adults and older people. Rest assured, they are not cause for panic. As the disc protrudes out between the vertebrae and presses on a nerve, you will experience symptoms in whatever part of your body the affected nerve serves. Bulging disc pain may start slowly and get worse over time or appear during certain activities. Since most bulging discs are mild to moderate and resolve on their own within a few weeks, treatment typically begins conservatively. As an alternative to surgery, some doctors will utilize the regenerative properties of adult stem cells. Canal stenosis, also known as spinal stenosis or central stenosis, is the narrowing of the space within the spine, putting pressure on the spinal cord and the nerves that travel to your arms and legs. Aging — With age, the body’s ligaments can thicken. Spurs may develop on the bones and into the spinal canal. The cushioning disks between the vertebrae may begin to deteriorate. The facet joints on the spinal column may also begin to break down. All of these factors can cause the spaces in the spine to narrow. Osteoarthritis – The most common form of arthritis. It occurs when the protective cartilage on the ends of your bones wears down over time. Rheumatoid Arthritis – A chronic inflammatory disorder that affects the lining of your joints, causing a painful swelling that can eventually result in bone erosion and joint deformity. Tumors – Abnormal growths of soft tissue may affect the spinal canal directly by causing inflammation or by growth of tissue into the canal. Tissue growth may lead to bone resorption or displacement of bone and the eventual collapse of the supporting framework of the spinal column. Spine Instability — Also known as spondylolisthesis, spinal instability occurs when one vertebra slips forward on another. When this happens, it can narrow the spinal canal. Heredity — If the spinal canal is too small at birth, symptoms of canal stenosis may show up in a relatively young person. Structural deformities of the involved vertebrae can cause narrowing of the spinal canal. Trauma — Accidents and injuries may either dislocate the spine and the spinal canal or cause fractures that produce fragments of bone that can penetrate the canal. As an alternative to surgery, stem cell therapy may be an option to relieve symptoms of canal stenosis. A collapsed disc occurs when a disc in your spine loses some of its water content due to deterioration and age, causing it to shrink. When the disc collapses, the space between your vertebrae that it was cushioning is exposed, which leads to direct pain in this region. Changes in your discs occur as part of an age-related disorder called degenerative disc disease. A collapsed disc can happen in any part of the spine, including the cervical spine and the lumbar spine. Changes in posture can potentially make your symptoms worse or better. For example, you may feel worsening pain if you sit down, bend your back, twist your back, or make lifting motions. At the same time, your pain may disappear if you go for a walk, lie down, or stand up. When you have a collapsed disc in your back, the decay can lead to a herniated or bulging disc. In some cases, it can produce bone spurs. Surgery may not be the only solution. These days, adult stem cell therapy is gaining popularity with some physicians to rebuild deteriorating spinal discs. Degenerative disc disease is a term used to describe the normal changes in your spinal discs as you age. It can occur throughout the spine, but generally affects the lower back and the neck, resulting in osteoarthritis, herniated discs, or spinal stenosis. Because disc degeneration is a natural part of aging, over time all people will exhibit changes in their discs to a greater or lesser degree of degeneration.As the space between the vertebrae gets smaller, the spine becomes less stable. The body reacts by forming bone spurs that puts pressure on the spine, which results in pain and affects nerve function. The loss of fluid in your discs – This reduces the ability of the discs to act as shock absorbers and makes them less flexible. Loss of fluid also makes the disc thinner and narrows the distance between the vertebrae. Tears in the outer layer of the disc – The jellylike material inside the disc, or the nucleus, may be forced out through the tears in the capsule, which causes the disc to bulge, rupture, or break into fragments. A sudden injury, such as a fall, can lead to a herniated disc and begin the degeneration process. As an alternative, stem cell therapy may be a less invasive solution. Also known as osteoarthritis or spondylosis, degenerative joint disease is the deterioration of cartilage that supports the weight-bearing joints in your body. Through time, this condition can be very debilitating and hinder movement. Degenerative joint disease (osteoarthritis) is the most common form of arthritis, affecting millions of people worldwide. With degenerative joint disease, the surface layer of cartilage breaks down and wears away. This allows the bones under the cartilage to rub together, causing pain, swelling, and loss of motion of the joint. With time, the joint may lose its normal shape and form small deposits of bone, called bone spurs. Bits of bone or cartilage can break off and float around inside the joint space, which causes more pain and damage. This condition affects about 80% of people over 60, but it is known to begin from an injury that weakens the affected joint’s ligaments. People with degenerative joint disease usually have joint pain and some movement limitations. Unlike other forms of arthritis, osteoarthritis affects only joint function and does not affect skin tissue, the lungs, the eyes, or the blood vessels. Although osteoarthritis is more common in older people, younger people can develop it. Before age 45, more men than women suffer from it, but after age 45, it is more common in women. It is also more likely to occur in people who are overweight and in those with jobs that stress particular joints. Osteoarthritis symptoms often develop slowly and worsen over time. If you have joint pain or stiffness that lasts for more than a few weeks, make an appointment with your doctor or physician. Some physicians recommend regenerative medicine as an alternative to invasive surgeries that may leave you incapacitated for a lengthy period afterwards. Common in the adult working population, degenerative spine conditions involve the gradual loss of structure and function of the spine, typically caused by the normal wear and tear of the bone and soft tissues in the spine. People who put increased strain on their necks and backs can increase the rate at which this wear and tear occurs. Though it shouldn’t be taken lightly, a degenerative spine is fairly common. Your spine is made up of a complex series of muscles, vertebrae, ligaments, and intervertebral discs that can deteriorate over time. The discs are particularly important because they act as shock absorbers for the spine. In addition to allowing for flexibility in your spine, they prevent the vertebra from grinding against one another. With age, the constant tension and stress that our spines endure take a toll on our intervertebral discs. Age-related changes also make our discs drier and weaker, causing them to deteriorate and become less effective. This ultimately leads to degenerative spine disorders. Pinched nerves — A pinched spinal nerve is a common condition that most people will experience on occasion as they grow older. When the symptoms of a pinched nerve don’t abate on their own over several days, they could be the byproduct of one of the aforementioned degenerative spine conditions. Alleviating the symptoms is contingent on identifying and addressing the cause of the nerve constriction. Degenerative disc disease — A condition that describes the breakdown of intervertebral discs. As we grow older, the intervertebral discs dehydrate and the proteins that keep them healthy break down. As the discs deteriorate, they become less effective at supporting the vertebrae. This can cause the vertebrae to become slightly displaced and put pressure on the nerve roots that travel in between the vertebrae, or press on the spinal cord itself. Herniated discs — A herniated disc refers to an intervertebral disc that has ruptured, allowing the inner gel-like disc material to seep into the spinal canal through a tear in the disc wall. This condition can be painful if the nerves that innervate the disc become irritated or if the extruded disc material irritates the spinal nerves. Bulging discs — A bulging disc refers to an intervertebral disc that has swelled beyond its normal parameters between adjacent vertebral bodies. The enlarged disc remains structurally intact but, due to increased pressure, has expanded into the spinal column. A bulging disc is not inherently symptomatic, but when the disc wall comes in contact with the spinal cord or any nearby nerve infrastructure, painful symptoms can develop. Degenerative scoliosis — While most people equate scoliosis with adolescence, degenerative scoliosis is a spine condition that can develop later in life. When scoliosis occurs, it causes a side-to-side curvature of the spine, which can result in a hunched posture and a change in gait, among other symptoms. Spondylolisthesis — Spondylolisthesis is a condition indicated by the presence of vertebral misalignment. 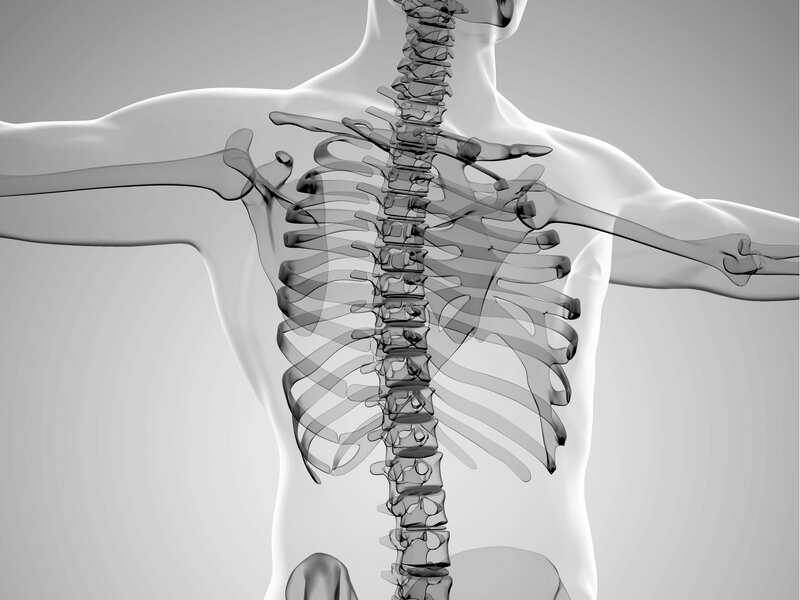 In an otherwise healthy spine, the spinal column has a natural s-curve that evenly distributes weight along its length. With spondylolisthesis, one of the vertebral bodies in the spinal column slides out of its normal position. Spinal osteoarthritis — Also referred to as degenerative spinal arthritis, this condition involves the breakdown of cartilage located on the spinal facet joints. When osteoarthritis occurs, cartilage wears away, allowing bone-on-bone contact to occur within the joint. This can cause inflammation, the formation of bone spurs and nerve irritation. Spinal stenosis — Spinal stenosis describes the narrowing of the spinal canal. This isn’t necessarily problematic by itself, but when the canal space becomes constricted, the spinal cord and other nerve structures can be irritated. Common causes of spinal stenosis include the presence of herniated disc material, bone spurs and other tissue. Bone spurs — Bone spurs are smooth protrusions of excess bone that frequently accompany arthritic deterioration. While these growths of bone are asymptomatic in and of themselves, the excess material can become problematic if it comes in contact with a nearby nerve. Bone spurs also often form in the aftermath of an injury. Sciatica — Sciatica is a term that is frequently used as a catch-all to describe the symptoms that arise from the inflammation and irritation of the sciatic nerve. This nerve originates at the base of the spinal cord and extends downward through the lower body before ending near the feet. Most commonly, sciatica is associated with chronic lower back and leg pain. A ruptured or herniated disc is a degenerative spine condition. It is also known as a disc extrusion. It is where the nucleus material of an intervertebral disc seeps into the spinal column. This can lead to nerve compression resulting in significant neck and back pain. Disc extrusion can be caused by traumatic injury, overexertion, illness, and obesity. The most common cause of disc extrusion is a degeneration that accompanies the body’s natural aging process. Dehydration – the discloses water and collagen. A dehydrated disc becomes thinner. It also becomes less elastic and less able to absorb the pressures of the spine’s day-to-day movements. Bulging disc – the disc bulges beyond its normal perimeter. The core of the disc is called the nucleus pulposus and it is under pressure from surrounding vertebrae. It can press on a weakened disc wall and bulge beyond the perimeter. Disc protrusion – a more severe form of bulging disc is called a disc protrusion., The disc is still intact but it has protruded farther into the spinal canal. Such protrusions may involve up to 180 degrees of the disc’s total circumference. Disc extrusion – a disc wall develops a tear caused by a large amount of pressure, and the inner disc material extrudes into the spinal canal. This can exert pressure on nearby spinal nerve roots or the spinal cord. As an alternative to invasive spinal surgery, adult stem cell treatments may be an option for sufferers of this condition. Disc protrusion is more commonly known as a slipped disc. It is a common form of spinal disc deterioration causing neck and back pain. A disc protrusion can occur anywhere along the length of the spinal column from the neck to the lower back, placing extra pressure on the nerves and muscles around it. Disc protrusion is the first stage of disc degeneration following the dehydration and weakening of a disc. Symptoms caused by a disc protrusion depend on the extent of the disc degeneration and the location of the problem. The most common areas of the spine to develop disc degeneration are the cervical spine (neck) and the lumbar spine (lower back), because both regions are highly flexible and support significant weight. When a disc slips in the neck it can cause localized pain or it can cause heaviness in the arms and legs, difficulty walking, and the deterioration of fine motor skills in the hands. Alternatively, a slipped disc in the lower back that compresses a lumbar nerve root or the sciatic nerve may cause lower back pain and symptoms can extend through the shoulders, arms, and fingers as well as numbness, tingling, sharp pain, and muscle weakness in the legs, feet, and buttocks. As a person ages, they begin to lose water content in their discs, which can cause them to slip out of place. Disc protrusions are more common in men than women, particularly those who are 35 to 45 years old. As a much less invasive alternative, injections of adult stem cells harvested from your own body may be an option for healing the damaged disc. Facet joints connect vertebrae to each other. The facet joints between the vertebrae make your back flexible and allow you to bend and twist. Facet disease occurs when these joints begin to degenerate. It can affect any level of the spine, but facet disease is most common in the lumbar region (lower back). As a much less invasive alternative, injections of adult stem cells harvested from your own body may be an option for healing the facet. Facet joints connect vertebrae to each other. The facet joints between the vertebrae make your back flexible and allow you to bend and twist. Facet syndrome, also known as osteoarthritis, is a common cause of neck and back pain in which facet joints become swollen and painful. Patients with facet syndrome typically have difficulty twisting and bending their spine. Patients with facet syndrome in the neck may have to turn their entire body to look left or right. Patients with facet syndrome in the lower back may find it difficult to straighten their back or get up out of a chair. Symptoms may occur in the neck, shoulders, arms and hands if the nerves affected are in the cervical spine. If the affected nerves are in the lumbar spine, symptoms may be in the buttocks, legs, and feet. Patients with symptoms may feel worse in the morning and improve after moving around as the day progresses. Patients work all day from a seated position with poor posture may experience pain at any time throughout the day. Facet syndrome is commonly caused by aging, but it can also be the result of trauma due to injury or too much pressure placed on the facet joints. Diagnosis is typically performed by injecting the joints with a small amount of X-ray contrast material, local anesthetic, and cortisone. As a much less invasive alternative, injections of adult stem cells harvested from your own body may be an option for healing the damaged facets. Failed back surgery syndrome (FBSS) is a generalized term describing the condition of patients experiencing continued pain after surgery. It can be caused by a natural buildup of scar tissue, and FBSS doesn’t necessarily mean the operation was a failure. The likelihood FBSS is increased with repeated surgery. Because the causes of failed back surgery syndrome can be difficult to pinpoint, it can also be challenging to treat. Successful treatment depends on an accurate diagnosis of the source of pain and the use of appropriate therapies to address it. For some patients, adult stem cell therapy may be effective in treating the symptoms resulting from failed back surgery syndrome. A foramen is a space inside the body which allows nerves, arteries, veins, or other structures to connect one part of the body with another. Foraminal stenosis is a narrowing of the cervical disc space caused by inflammation of a joint in the spinal canal. It is typically identified by an intermittent pain developing slowly over years and it is related to a certain activity or position. Foraminal stenosis usually results from spinal degeneration occurring during the natural aging process. Foraminal stenosis is most common in the cervical spine (neck), but it can also occur in the lumbar spine (lower back). Spinal injuries resulting from trauma, repetitive movement, or being overweight can also speed up the process or cause spontaneous degeneration. The resulting changes in the spine can cause the foramen to become narrower, resulting in less space for the surrounding nerves. Foraminal stenosis is diagnosed through a physical examination where the doctor looks for limitations of movement, pain, or loss of reflexes when the patient moves their spine. For some patients, adult stem cell therapy may be effective in treating the symptoms resulting from stenosis. A herniated disc is a degenerative condition in which some of the soft, jellylike center of an intervertebral disc pushes out through a crack in the exterior of the disc. Sometimes, it is referred to as a slipped or ruptured disc. It is typically caused by the normal wear and tear of aging. As the body ages, the discs in the spine lose some of their water content. This makes the discs less flexible and more prone to tearing or rupturing. Disc herniation is often the result of this degeneration. A herniated disc typically occurs in the lumbar spine (lower back), but it can also be found in the cervical spine (neck). Some people experience no symptoms at all, but a herniated disc can irritate nearby nerves. This can result in back and neck pain, along with numbness or weakness in an arm or leg. Conservative treatment relieves symptoms in 9 out of 10 patients suffering from a herniated disc. In most cases of herniated disk, a physical exam and a medical history are all that’s needed to make a diagnosis. In some cases, imaging tests are required. For some patients, adult stem cell therapy may be effective in treating the symptoms resulting from a herniated disk. Nerves extend from the brain and spinal cord, and a pinched nerve occurs when too much pressure is applied by the bones, cartilage, muscles, or tendons surrounding a nerve. This pressure can affect the nerve’s function and it may also cause pain, tingling, numbness, or weakness. When a nerve is pinched, the initial symptoms may be localized. Depending on the location of the injury, this can also cause pain distant from the point of pressure. Damage from a pinched nerve can be minor or severe and it may cause temporary or long-lasting problems. For some patients, adult stem cell therapy may be effective in treating the symptoms resulting from a pinched nerve. BennuLife is dedicated to performing stem cell research and being at the forefront of regenerative medicine. Mesenchymal, bone marrow-derived stem cells are supported by extensive research as an effective treatment for orthopedic conditions. A recent study done by BennuLife scientists indicates that you need a critical minimum number of stem cells in order to derive benefit from the injection. The study showed that, when done correctly, stem cell therapy resulted in significantly better outcomes than surgical options, such as fusion and disc replacement. The BennuLife treatment protocols allow for the highest possible stem cell counts. Additionally, these results have been maintained after three years of follow-up. These are incredibly encouraging results! This 2018 study represents patients with lower back pain being treated with bone marrow concentrate. At one year follow up, all patients experienced a decrease in resting and active pain. They also reported a mean 80% total overall improvement.